Panasonic viera link compatible and also works with other brands like Sony,Canon,JVC,Samsung etc. IBRA Mini HDMI to HDMI cable delivers both high-definition video and digital audio from digital devices to your home theater. It is the perfect choice for connecting camcorders and cameras to HDTVs, monitors, or projectors with HDMI input. - HDMI ports supporting Ethernet are needed for internet sharing. - Mini HDMI cable is not compatible with tablets that have a Micro HDMI port. - Please check your device specification to check if it takes a Mini HDMI (Type C) or a Micro HDMI (Type D). Looked at buying one of these cables so that I could connect my SLR to hotel TVs when travelling. Two shops had them for over £25!!! Ordered this cheap one at 23:00 on a Wednesday night and the package dropped through the door at 08:45 Friday - pretty impressive for "free delivery"
The cable comes with very useful plastic covers for the plugs. Works great with the Nikon D700 and I get really nice HD TV pictures of the photos and even the menus!! Quality leads that WORK. Don't waste your time with the 'bargain' £1.50 mini HDMI leads from other Marketplace vendors - they probably won't work and you'll wait a month for a refund. I finally bought from HD zone and this Mini HDMI to HDMI lead works perfectly with high quality audio and HD video with all my hdmi/mini-hdmi equipment : Nikon DSLR, Canon compact camera, Panasonic & Sony HD LCD tv's. Cheap HDMI to HDMI may work but mini-HDMI have much, much finer signal contacts so cheap leads are prone to failure or even not work at all. I could not believe how fast the item got to me, this was amazing. I used the cable to connect my Sony 3D camera to the TV which works perfectly, the quality of the picture and video is excellent. The cable has 2 different size connectors as the connection to the camera is smaller than the TV. It is reasonable light weight so I left it connected to the TV, this is easy for me as I use my camera a lot to view photos. All I need to do is connect the other end to my camera. This way I don't have to search for the cable I know exactly where it is. I am very pleases with my purchase and at such an affordable price you cannot go wrong. 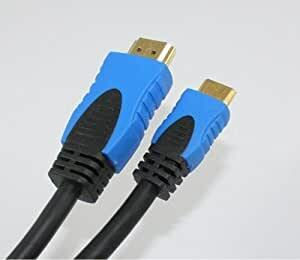 This is the HDMI Cable to buy to connect your camera to TV or other electronic device, superb quality. This HDMI Cable is outstanding........ It's smart, It's Triple Shielded, It's Latest Spec,, Uses High purity oxygen free copper conductor, Has plastic Dust caps on the ends, & feels like a Quality product.. & comes with a 10 year manufacturers warranty..
the lead looks well made, the black and blue colours make it look smart, much cheaper than local shops if they even have them in stock, I would recommend this product very highly as it produced great images from the Canon 7d Hi Def video, straight from camera. 5.0 out of 5 starsSuperb quality!!! I recently purchased this Mini HDMI cable to watch 1080p HD video taken on holiday on my Canon camera. I have to say the picture quality was second to none, absolutely fantastic crystal clear. I would highly recommend this product, so simple to use just plug in and off you go, no faffing around transferring video onto discs or viewing on a small computer monitor, just connected up to one of the HDMI ports on my tv and off i went, i'm no hi tech boffin so if I found it simple believe me it really is!!! Given that this item is priced 5x lower than PC World, you might expect it to be lacking in some way. It isn't. it's a good quality cable that does the job perfectly. It even comes with small terminal protection caps. Results from my Panasonic GF1 and Pentax K5 on the TV screen are excellent, noticeably better than the yellow and white plug video cable supplied with the cameras. 5.0 out of 5 starsTOTALY HIGH QUALITY HDMI LEAD. This is a superb hdmi lead, fits my Panasonic SD-900 Camcorder perfectly, no interference, very fast delivery from HD ZONE and superbly packaged, i very HIGHLY RECOMMEND HD ZONE, a credit to Amazon who are also great.